Tourist attractions in Bali are very diverse. But most tourists who come to Bali would want to enjoy the natural scenery. Similarly, the foreign tourists, who prefer to find a natural tourist attraction that can fulfill their travel needs. Waterfall is one tourist location that has its own charm in the eyes of the tourists. Including the Waterfall Tegenungan Bali. This waterfall is not a high waterfall, like some waterfalls in the area Singaraja. However, visitors who come there will still get a good impression of this tourist attraction. Tourists who come to the waterfalls are also not only domestic tourists, but also foreign tourists. Actually this tourist attraction has been opened since 1989 ago. However, it is only recently popular along with the development of information networks and also the internet (social media). Most foreign visitors who come are young people who want to feel the sensation for their adrenaline rush. 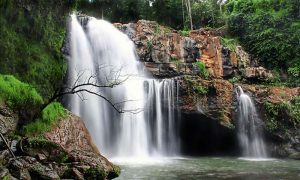 The attraction of Waterfall Places in Bali is a very natural sight. around the waterfall are the green trees are very cool eye. There are also some natural rocks. Another interesting point of this attraction is the exciting activities that can be done there, namely jumping from the top to get to the bottom of the waterfall. Most of these extreme activities are performed by foreigners or foreign tourists. But if you are interested and courageous, just try bermanufer there. Before jumping, visitors must climb first to the top of the waterfall by climbing the rock hill that is at the edge of the waterfall itself. However, keep in mind that this extreme activity can be done only with guide assistance and should not be done alone. This is also done for the interest and safety of the visitors themselves. In addition, visitors can also enjoy the atmosphere by playing water or bathing around the waterfall and the river. Visitors can also take pictures as much as possible in this cheap tourist attraction. You can also swim in the water while enjoying a natural atmosphere that may not exist in the city. To enjoy tourism activities in Tegenungan Waterfall Bali, visitors do not need to pay expensive, because the ticket price is only Rp 5,000 for domestic tourists and Rp 10,000 just for foreign tourists. Obviously this tourist attraction can be one of the cheapest travel alternative in Bali and suitable also for the backpacker. For now, this tourist attraction is still managed by the surrounding community. And the funds from the admission result will be developed as a fund for the development of tourist objects and additional facilities later in the day. You can visit this tourist site from 08.00 to 17.00 WITA. Tegenungan waterfall located in Banjar Tegenungan, Kemenuh Village, District Sukawati, Gianyar, Bali. The location of this tour is also quite close from downtown Denpasar and also Places of Interest In Ubud. You can drive approximately 16 kilometers from Denpasar, with a journey of approximately 45 minutes. In addition, this tourist attraction is also located near the main road so it will be easier to find. 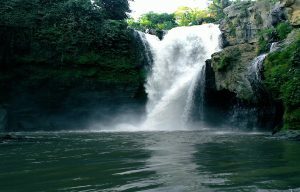 Arriving at the waterfall tourist area, visitors can enjoy views of Tegenungan Waterfall Bali and also the river that flows beneath it. But from the parking lot, tourists need to walk first through approximately 144 stairs. Should come during the dry season, because if the rainy season and the rain, the water there will be more cloudy than usual. Do not carelessly make any jumps or extreme activities without the knowledge of the manager, as there have been unpleasant events happening to some travelers who made unauthorized jumps first. If indeed you come by chance during the rainy season, better be careful with the flow of water. And better not linger bathing in the river or under the waterfall. Do not forget to bring a change of clothes. Use a comfortable footwear to move on this natural tourist attraction so that travel can also be more comfortable. Keep the cleanliness and courtesy in every tourist attraction. The object of this tour has become known by the community, so if you want a quieter atmosphere, come on a normal day and avoid holidays like weekend and long holidays.